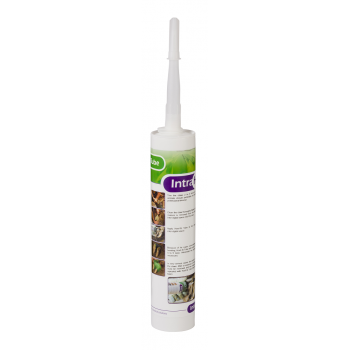 Intra Hoof-fit Tube is a unique product in dairy farming and is now globally known as the product of choice to deal with claw problems. Hoof-fit Tube is now the standard of care in many countries for controllong digital dermatitis. Hoof-fit Tube contains copper and zinc (both having antibacterial properties) in an organic chelated form. This coated form is more stable than conventional forms of copper and zinc, like sulphites and oxides. This enables the active substances to better penetrate the core of the digital dermatitis inflammation, combating the whole infection. This product also contains isopropanol, reinforcing the antibacterial action of the product. Chelated zinc and other skin care products promote wound healing: the wound will close quickly. Antibiotic spray does not have such a wound healing action. 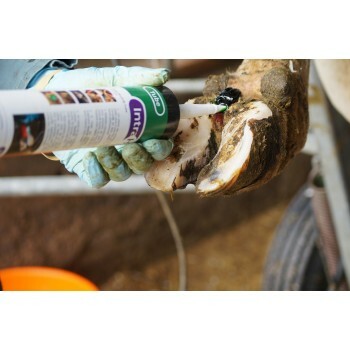 Hoof-fit Tube heals the claw and the tissue around the claw, thereby reducing the risk of new bacterial infections. Finally, the Tube contains a strong adhesive, prolonging contact with the infection on the claw. The Tube will also continue to be active when cows walk through manure after treatment.